Flat vegetable flowers are great for dressing up your bento to finish up.Â Put them on broccoli, on rice, on sandwiches, etc… anywhere you want. It adds a nice finishing touch and will definitely cutify your bento. 1. 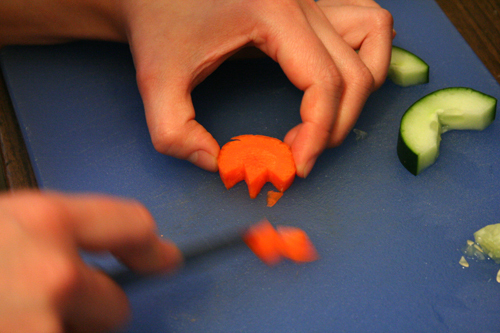 Slice a carrot and make upside down V-shape incision around the carrot. 2. If you don’t like eating carrot skin, you can cut the outside part. 2. 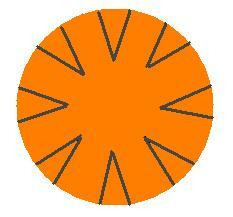 Use a straw to make holes on where petals are, and on the center. Carrot flower #1 looks really adorable on broccoli. I usually use baby carrots for this, but you can just use the smaller part of a carrot. 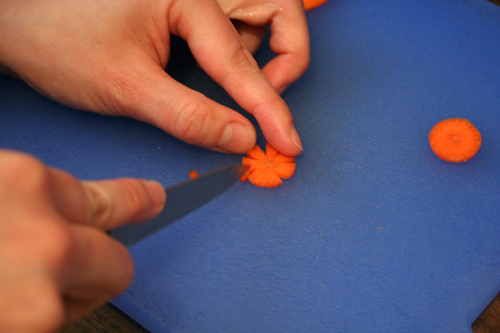 The secret weapon to make simple yet fancy-looking Carrot flower #2 is a straw! You can also make flowers out of cheese, apple, ham, anything that’s soft enough to make a hole with a straw. 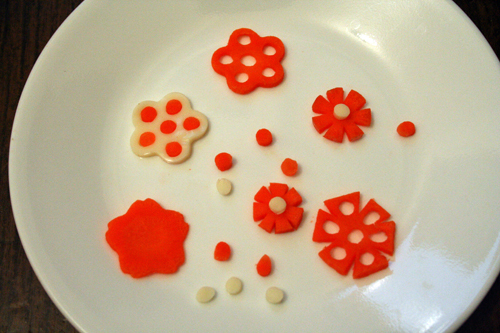 In the picture below, I made a flower with cheese, and swapped carrot bits & cheese bits. If you don’t have a cookie cutter, don’t worry. 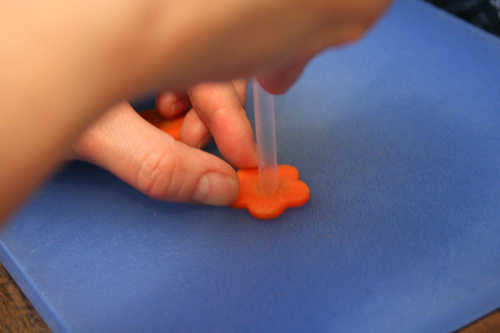 You can make a Carrot flower #1, and use a straw to cut out holes. (like the one at the right bottom) If you have hard time getting a veggie piece out of a straw, just blow it out from the other end.Â I save carrot bits I get from cutting carrot with a straw. You can use them as eyes or cheeks (if you’re making animals or people), or just sprinkle them around in your bento! A cookie cutter and a straw can make an ordinary carrot look pretty fancy! 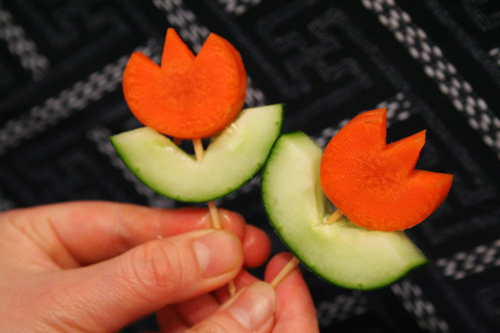 Carrot tulip is more 3D, so you can stick it in the corner of your bento box like veggie sticks. 1. 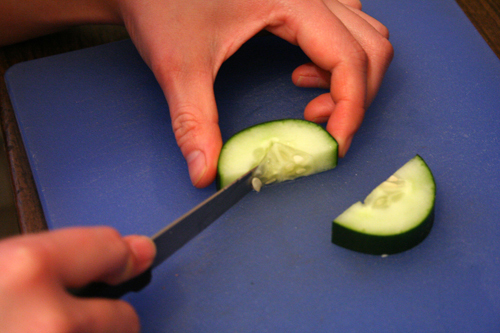 Slice a cucumber about 3/4 inch thick, and cut it in half. 2. Cut out V-shape where seeds are. 3. Cut the carrot like a tulip. This is what a tulip looks like in my head. 4. 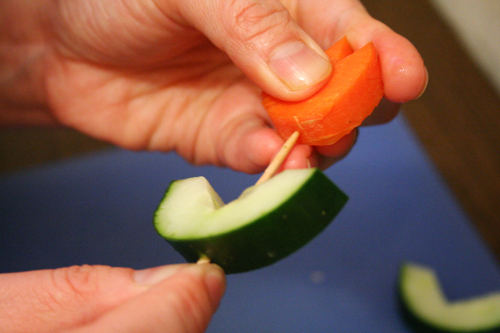 Stick toothpick through the cucumber and carrot, and done! Also great for a party! You can also check out more “how to” on my blog and my flickr. How cool are these! I was a bit scared off by the beauty of them, and thought they would be over my head in terms of technique, but I think even I can do this. Thanks, my 4 yr old will be in heaven on Monday. no other words… i love you…kikikkkkiikkk..
thanks for sharing your this..putting lots of effort describing it step by step.. 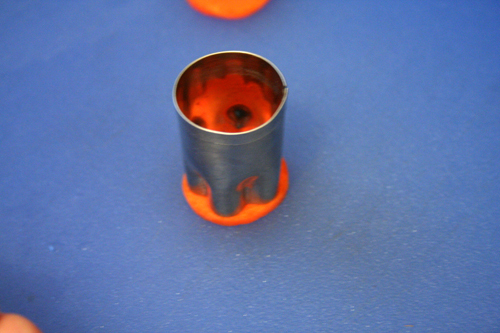 I manufacture stainless steel cutters for use in a hand potato chipper. The cutters are computer generated and can be almost any shape. The cutter produces a baton form that is then simply sliced to make the shapes. I can send pictures of some shapes that I have already made if you are interested. Please send pixs of your stainless steel cutters. Also, do you sell the actual product? I just love your website and all the great things you make! Very cute! I’ll have to try it! Thanks for showing us this! Love how easy and cute those little tulips are! Perfect for the garden bridal shower we’re planning! Wow that’s time consuming but it’s worth all the work!